Preheat oven to 375 degrees F. Stir flour with baking soda and salt; set aside. In large mixer bowl, cream butter with sugar, brown sugar, eggs, and vanilla. Gradually blend dry mixture into creamed mixture. Stir in nuts and chocolate chips. 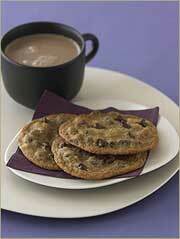 Drop 1 tablespoon of dough per cookie onto ungreased cookie sheets. Bake at 375 degrees F for 9 to 11 minutes or until golden brown.